The Street of Dreams — Sobre Sound "
Listening to rock ‘n roll was once a rebellious act. When The Beatles went on Ed Sullivan in 1964, it angered much of mainstream America. Even possessing the cultural contraband was frowned upon and inappropriate. Attempting to marry what was once socially unacceptable with high society traditions, teeters on the precipice of impossibility. 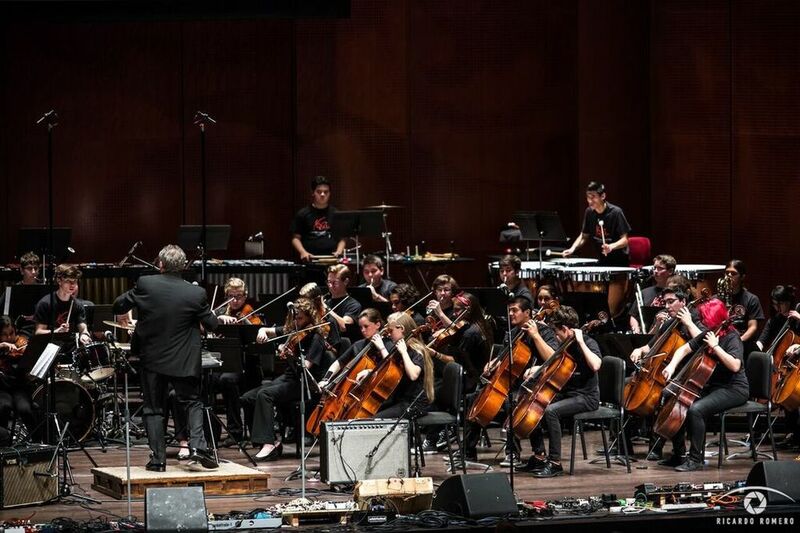 Last week, Youth Orchestra San Antonio nearly sold out The Tobin Center for a performance of The Beatles’ Abbey Road. With 11 bands and the Marcsmen Chorus, YOSA brought us along a musical journey that utilized the classic rock album to tell a story, as opposed to a straight reinterpretation of Abbey Road. The casting was very important. Picking the right artist for the song and the right song for the artist was critical. The first set of bands: The Please Help, Sioux and Fox, Octahedron and Femina-X performed a prologue of sorts with four songs not found on Abbey Road. As we all waded into the abyss of pressure and nervousness on a grand scale, YOSA kicked off the night with “Malambo” from Estancia by Alberto Ginastera. Octahedron, led by the gracious Elena Lopez and Austin Jimison, brought confidence on stage after some beginning hiccups. Daniela Riojas’s delicate and beautiful version of “Hey Jude” morphed into a Latin rock style that was very Femina-X. The main body of the journey was found in the first seven songs of Abbey Road and are the types of songs that have been an intimate part of people’s lives, the type of songs you get lost singing along with and forget for a moment, you’re in the middle of a performance hall with a philharmonic. Buttercup brought a much needed sense of rock n’ roll to the stage during their rendition of “Something.” Joe Reyes, who visited the stage multiple times that night, nailed the guitar solo and deserved all the cheers that followed. Buttercup’s experience enabled them to adapt to the sound situation on the fly but most importantly: they enjoyed themselves. After the first few notes of Alyson Alonzo & The Sugar Skulls' “Oh Darling,” you could sense the crowd was completely stunned. Alonzo immersed herself in the moment and set the place on fire. Both of fishermen’s appearances on stage could only be described with one word: ‘victorious.’ They were perfect for their respective songs, “I Want You” and “Carry That Weight.” The arrangement of Emissaries’ “Here Comes The Sun” took the main guitar hook and split it between the acoustic guitar, violin and cello, it was genius. As Emissaries bowed to a cheering crowd, our musical journey took a turn into an interlude with a full men’s choir. The Marcsmen Chorus was spooky good. The song “Because” is trippy already with the hazy and psychedelic, dream-like vocal arrangement. It was one of the few moments of the night that was free from the uncertainties of technology, except for the electric piano of Jamie Ramirez. As The Marcsmen’s enigmatic performance wound down, we hurriedly jumped into side 2 of Abbey Road. Running through several songs with a rotating cast of singers and guitarists was difficult, needless to say, but one thing that may have gotten lost on everyone: IT WAS FUN. These are creative and special occasions that come with a certain level of risk with many unknown factors at play. Not much can prepare one for a life of performance. The stage can be one of those on the job training situations. The exhilaration of a large audience cheering or the panicked feeling of uncontrollable errors can make or break the night for any performer, rookie or veteran. San Antonio’s music community is one big family, and there’s no better place to grow than on your home court. As the modern music experience becomes more and more customized and live music more of a social gathering, YOSA Presents combines our favorites things from both the past and present musical worlds. ¡OTRA! ¡OTRA! ¡OTRA!